as you will have noticed some changes have been made to the website. After succesfully finishing the BRC 2010 count on Oct 16th allready big steps were taken in the organisation of BRC 2011! Thanks to the enthusiasm of many people worldwide BRC is keeping up it´s growth. Again in 2011 many new initiatives will be undertaken in Batumi, such as independent and joined research projects, a renewed student program and of course the continuation of our monitoring initiative. You can now find out more about the 2011 BRC edition and other options for teaming up with us under Get Involved! We will also be looking for volunteers to help out in practical organisation in this section! Several of you will be waiting for the full numbers of BRC 2010 along with our conclusions on the Kazbegi pilot project and the evaluation of the renewed monitoring scheme. All of these are currently in the making ... Announcements will be made as soon as these updates are available! Over 10 days since the last update and the weather conditions in Batumi have changed dramatically compared to what we experienced in September. At the start of October temperatures have dropped by more than five degrees whilst the lack of precipitation during September is now being compensated by many days with extremely hard rains alternating with bright, sunny days. October did start very well when out of nowhere no less then 1,500 Red-footed Falcons Falco vespertinus were seen from our coastbound counting station! This is truely an exceptional number and presumably among the highest ever recorded for the species anywhere. To put it in perspective, with a total ± 300 ind. per year in 2008 and 2009 we usually only get a fifth of this number in a year. The falcons started at mid-day when suddenly over 800 birds were seen in about 30 minutes time. This huge boost was followed by some quiet when half an hour later they started again, this time with more than 200 birds. This second boost was followed by a more steady migration of Red-footed Falcons accompanied by some Hobbies Falco subbuteo during the rest of the day. The following day this enormous stream seemed to have passed completely and only some small groups and single birds have been seen since. 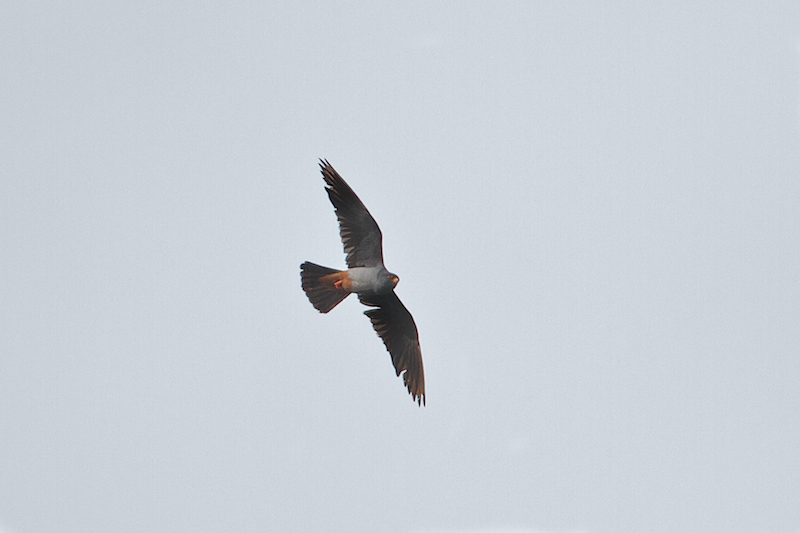 However, the rain that followed on the 1st of Oct. resulted in lingering groups of Red-footed Falcons of 40+ ind. in the Batumi harbour and the Chorokhi Delta. A juvenile Steppe Buzzard. This species continues to migrate far into October. Photo by Freek Verdonckt. After that stunning Oct. 1st things returned to normal with typical late-autumn migration of many hundreds of large Aquila eagles and tens of thousands of Steppe Buzzards Buteo buteo vulpinus. In general persisting rain that often moves northward stops migrating broad-winged raptors to a great extent. When drier days arrive we mostly observe promising morning activity of buzzards kettling early in the day, though these are birds that have been roosting nearby, only to take advantage of dry conditions from the moment these arise. Typically migration seems to stop after this, only to come to a very sudden and intense arrival of many thousands of birds in the early afternoon. It is very likely such fronts (or ´birdwaves´ as counters often describe them) have collected just north of the precipitation zone that grounded them the day(s) before. When conditions are right they start to kettle in huge numbers to arrive at Batumi almost simultaneously. This type of movement has resulted in three peak days during the last week with a total 50,000+ raptors each. Only some days ago on Oct. 7h there was a huge day of migration when roughly estimated some 80,000 Steppe Buzzards migrated along Batumi. 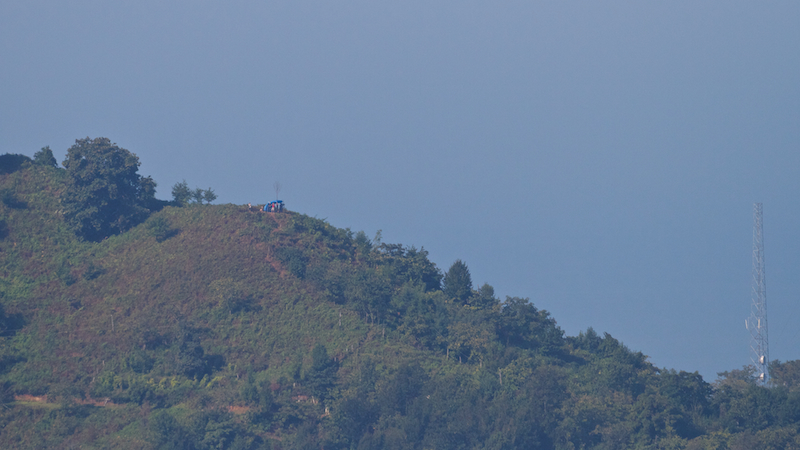 On all of these days there were large numbers of Lesser-spotted Eagle Aquila pomarina (ca. 500 per day) circling by the dozen together with up to 2,500 buzzards in a single kettle. 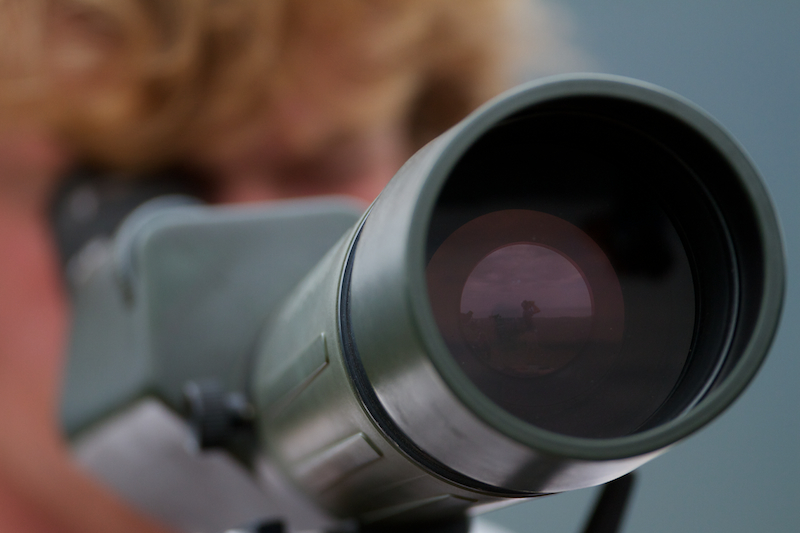 For several hours, 200 to 250 buzzards crossed the telescope view of an observer every minute. A Lesser Spotted and a Steppe Eagle. 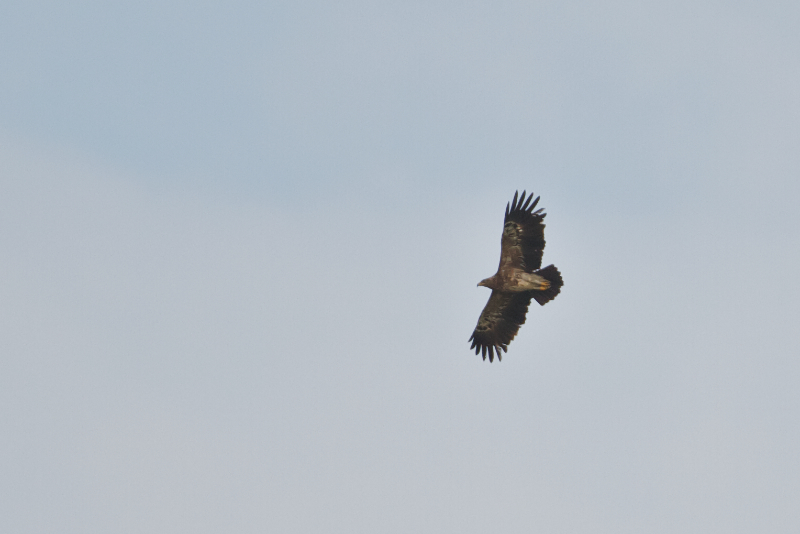 In Batumi we daily see fair numbers of Steppe, Lesser and Greater Spotted Eagle. Photos by Freek Verdonckt. In general the identification and ageing of the Aquila species can be difficult when flocks of over 50 ind. are approaching. Nevertheless most of the birds are clearly Lesser-spotted Eagles (a lot of adults compared to some time ago) and many Steppe Eagles Aquila nipalensis (20+ per day) and Greater-spotted Eagles Aquila clanga (15+) have been succesfully identified. This included many juveniles of A. nipalensis and A. clanga but also consistently some of the first adult-type plumages in the last days. Short-toed Eagles Circaetus gallicus are generally picked up more easily, as their huge appearance and ´king-of-the-hill´ type of flight sets them apart from the Aquila species. The Short-toed Eagle is now observed with upto 100 ind. per day on those days when we get that truely spectacular raptor migration. Short-toed Eagle - always fun! Photo by Freek Verdonckt. Rarer species this week included one adult and two juvenile Griffon Vultures Gyps fulvus that were seen on the peak days. On Oct. 7th, 9th and 10th respectively three, two and one Imperial Eagles Aquila heliaca were observed, as was a juvenile Egyptian Vulture Neophron percnopterus on Oct 7th. One of the last Honey-buzzards. Juveniles typically migrate later than adults. Photo by Freek Verdonckt. Although the shift towards late-autumn species has now occured some time ago there are still stragglers of nearly all species that typically peak in late August or early September. These include max. daily totals of up to some dozen Honey Buzzards Pernis apivorus (of which suddenly some late adults have appeared, ± 5 Pallid Harrier Circus marcrouros and ± 10 Booted Eagles Aquila pennata. Diversity thus remains good whilst also good numbers of Common Kestrel Falco tinninculus and Lesser Kestrel Falco naumanni, Black Kite Milvus migrans and Marsh Harrier Circus aeruginosus can (still) be seen in good numbers. Even other species that should be more numerous in late October and November are now also appearing more frequently: Merlin Falco columbarius and Hen Harrier Circus cyaneus. A good addition to the raptors are some hundreds of Black Storks Ciconia nigra that were seen in flocks of up to 40 ind. strong during the peak days this week. It is also worth mentioning that due to the nearly complete abscence of migrants during the days of heavy rain and the high flight altitude of the birds on the sunny days neither hunters nor trappers had any real luck this week. Allthough we did find some unlucky birds (2 juvenile Red-footed Falcons, 2 Lesser-spotted-Eagles and ca. 10 Steppe Buzzards) the number of casualties has generally been small along the major flyway in the hills. This is not true for the Chorokhi delta and other stop-over sites at the coast where many roosting birds are disturbed frequently by many hunters. A nice anekdote comes from three days ago when one observer enjoying a day of rest on a rather calm day of migration was overwhelmed by a cload of dragonflies 10,000´s strong migrating at a slow pace along the coast. At least 15 Hobbies were seen migrating with them as they took advantage of this flying food supply. In conclusion, the Batumi raptor migration continues to live up to its standards. Huge amounts of birds, high diversity of species and good observation quality, making it the beautiful experience it is for all of our counters. Life in the region is simply dominated by autumn migration. With only six days of counting to go before the end of the 2010 season you may expect one more update by the end of this week. Keep an eye on the website, the final results will come soon!.